Delays in discharging older people from hospital cost the NHS £820 million a year, according to a report from the National Audit Office (NAO). Last year in acute hospitals, 1.15 million bed days were lost to delayed transfers of care, an increase of 31% since 2013. The NAO says rising demand for NHS services is compounded by reduced local authority spending on adult social care – down by 10% since 2009-10. The number of people in England aged 65 and over rose by 20% in the decade to 2014, compared with 8% for all age groups. By 2024, the figure is projected to rise by a further 20%. Between 2010 and 2014, older patients admitted as emergencies to hospital increased by 18%. Despite NHS England’s ambition to move care closer to people’s home, in 2015 older patients accounted for 62% of bed days in hospital. Longer hospital stays mean worse health outcomes for older people and increased care needs when they are discharged. Older patients in hospital can lose as much as 5% of muscle strength per day, and are also more likely than younger patients to acquire hospital infections. But the NAO report highlights the risks of discharging people before they are clinically ready. Premature discharge contributes to unplanned re-admission. There has been some limited progress towards adopting principles of good practice in managing hospital discharge, and the NAO says care partners must draw on these existing initiatives. More accurate measures should be developed to capture the number of older patients experiencing delayed discharge because the true figure may be much higher than official data suggest. And wide variation in the proportion of older patients admitted from emergency services suggests some hospitals can improve their management of admissions. 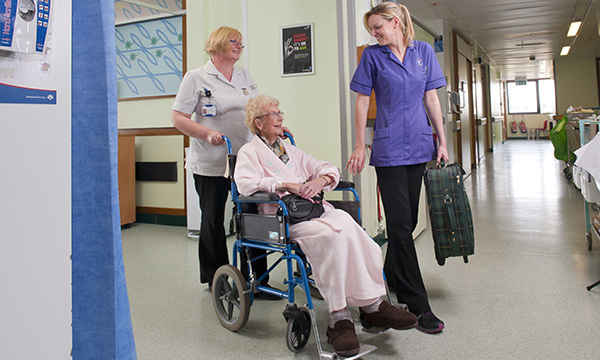 With rising numbers of older people staying in hospital longer than necessary, nurses will have to focus more on supporting patients to stay mobile and perform daily activities such as washing and dressing. The NAO says unfilled vacancies in hospital and community teams, and a consequent reliance on agency staff, make it harder to maintain knowledge of services that can enable timely discharge. Practitioners should also be better trained in the law governing the sharing of information between health and social care, according to a guideline on transition published last year by the National Institute for Health and Care Excellence. ‘I suspect there are always going to be problems with transitions in care, especially when it is from one organisation to another, but this report suggests the number of delayed discharges is going up dramatically. Funding issues are central. There does seem to be some linkage between the falling off in funding for local authorities and the worsening of delayed discharges.